This week, my Bloomberg Opinion colleague Shira Ovide took a close look at U.S. tech company capital expenditures. Three years ago, Alphabet Inc., Apple Inc., Amazon.com Inc., Microsoft Corp. and Facebook Inc. spent $40 billion on big-ticket physical assets; last year, they invested $80 billion , putting them in the ranks of automakers, oil and gas companies, and telecoms in terms of capital expenditure outlays. How is tech driving capex in other sectors? 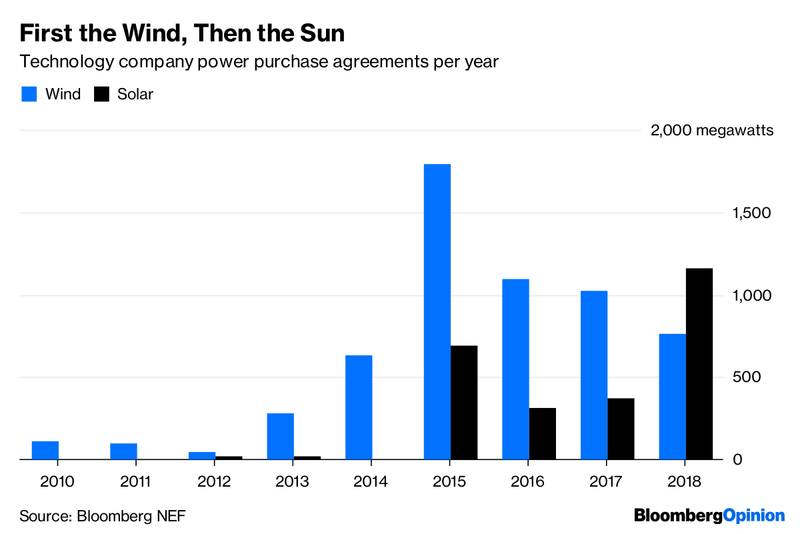 My Bloomberg NEF colleagues track the contracts private companies and the government sign with renewable-power generators to meet their electricity demand. Since 2010, they’ve signed agreements to buy nearly 18,000 megawatts from these generators of clean power. Tech companies are the biggest buyers; governments and universities are a distant second. 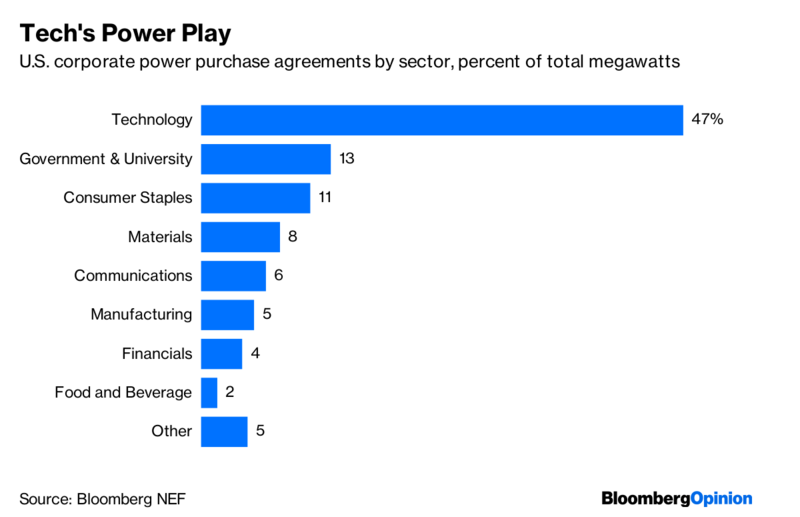 Corporations sign these purchase agreements for a number of reasons (sustainability goals and positive media coverage certainly being two), but the main reason is that long-term contracts with generators that have no variable costs are good for business. They give companies visibility on their power prices for several decades and, at least historically, have offered cheaper prices than what the grid provides. Given that long-term power buyers are price-sensitive, it’s worth looking at what tech companies have been seeking for their power. Since 2010, it’s been mostly wind power, but we can see the approach to parity (or better) for solar in the past year. Here’s the capex bit: Building all this new power generation for tech companies’ needs means billions of dollars in investment. Since 2010, tech companies’ demand has induced more than $15 billion in wind and solar investment just in the U.S. 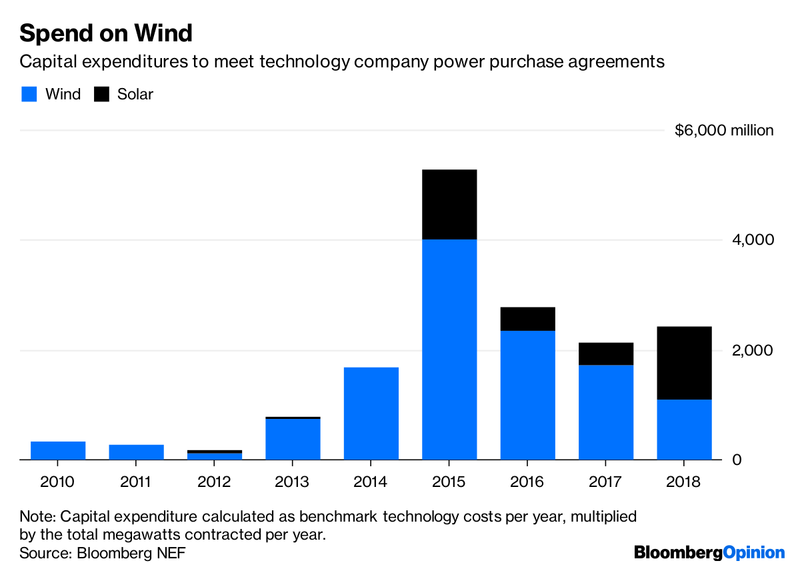 Announced wind and solar capex this year is more than $2 billion, with months yet to go, and with wind and solar capital costs half what they were in 2014. That $15 billion in energy capex isn’t tech spending, but it wouldn’t have happened without tech companies, either. And every wind or solar project built to meet the needs of a tech company helps drive down the costs of wind and solar power through greater deployment. It’s significant capex in monetary terms; it makes an impact on the entire energy system, too. Then there’s the transportation sector. Alphabet’s Waymo unit, for instance, is testing a fleet of self-driving vehicles. Should Waymo become a commercial service, it would need to spend millions or billions more on vehicles and charging networks (if those vehicles are electric). It might need to engage in some less-obvious capex, such as real estate to house its fleet and service centers to maintain its vehicles. Tech is a major spender on long-term assets. It creates major spending in long-term assets it doesn’t own, and there could be more coming. Software is eating the world , as entrepreneur and investor Marc Andreessen presciently said in 2011. It’s also building it, in lots of places.